Transparency Market Research (TMR) has published a new report titled, “Motion Sickness Treatment Market - Global Industry Analysis, Size, Share, Growth, Trends, and Forecast, 2018–2026”. According to the report, the global motion sickness treatment market was valued at US$ 670.0 Mn in 2017 and is projected to expand at a CAGR of 3.0% from 2018 to 2026. The report suggests that increase in number of travelers across the globe and rise in adoption of prescription motion sickness drugs are anticipated to drive demand for motion sickness treatment drugs and products from 2018 to 2026. Key players and researchers are investing in the development of new drug formulations and drug delivery systems for motion sickness treatment. Hence, adoption of prescription drugs is expected to increase in developed markets such as North America and Western Europe. These regions are likely to account for significant share of the global motion sickness treatment market during the forecast period. 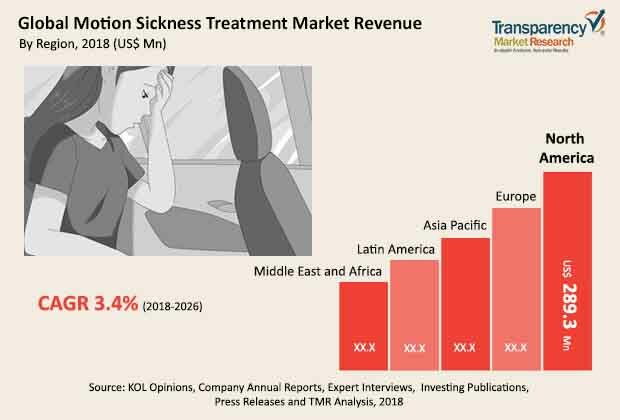 Surge in number of travelers in emerging markets such as China and India is likely to boost the growth of the motion sickness treatment market in Asia Pacific from 2018 to 2026. Motion sickness is a common condition experienced by around 50% travelers in the course of travel. Motion sickness is characterized by symptoms such as nausea, dizziness, and fatigue. It is experienced while traveling in a vehicle, boat, airplane, or even while being exposed to virtual reality (VR) such as VR games and simulations. Increase in number of travelers and surge in use of virtual reality is projected to drive the uptake of motion sickness treatment drugs and products. According to the United Nations World Tourism Organization (UNWTO), international tourist arrivals increased by 7% in 2017 as against the previous year and the trend to likely to continue in the near future. An article published in 2017 by Mediakix magazine stated that there are 22.4 million virtual reality users in the U.S. Ongoing developments in motion sickness drug development and delivery systems is projected to augment adoption of prescription motion sickness treatment drugs. However, introduction of generic transdermal scopolamine patches in the U.S. and availability of other such products in Asia Pacific are likely to hamper the market. Moreover, the global motion sickness treatment market is fragmented, with availability of large number of OTC products across the globe. The trend of self-medication using these low cost OTC products in developed as well emerging markets is a major concern among prescription-only drug manufacturers. The report offers detailed segmentation of the global motion sickness treatment market based on treatment type, route of administration, and distribution channel. In terms of treatment type, the anticholinergics segment is poised to account for leading share of the global market during the forecast period from 2018 to 2026. The segment is anticipated to expand at a CAGR of 3.5% from 2018 to 2026. The anticholinergics segment is expected to account for 50% to 60% market share during the forecast period. Long lasting relief, and better efficacy factors of anticholinergics such as transdermal scopolamine patches is estimated to contribute for its leading share and exponential growth rate. High adoption of transdermal scopolamine patch and comparatively higher prices are attributed to the leading share of the transdermal route of administration segment. Most of the OTC motion sickness remedies are offered in tablet form. Hence, the oral segment is likely to account for significant share of the market during the forecast period. The segment is projected to expand at a moderate CAGR of 3.0% from 2018 to 2026. In terms of distribution channel, retail pharmacies was the leading segment of the global motion sickness treatment market in 2017. The segment is projected to account for the dominant share of the global motion sickness treatment market during the forecast period. It is likely to expand at a CAGR of 3.0% from 2018 to 2026. Retail pharmacies offer prescription as well as over-the-counter motion sickness treatment drugs and products. The trend of self-medication using OTC motion sickness remedies is anticipated to augment the segment. The online pharmacies segment is anticipated to expand at a CAGR of 3.5% from 2018 to 2026. In terms of revenue, North America was the leading market for motion sickness treatment in 2017. High adoption of prescription motion sickness drugs in the U.S. is a major factor attributed to the large share of the region. Introduction of generic transdermal scopolamine is likely to hamper the growth of the market in North America. Surge in number of travelers is projected to augment the motion sickness treatment market in Europe. The region is anticipated to account for 24% to 28% share of the global motion sickness treatment market during the forecast period. Increase in disposable income and surge in number of domestic and international travelers are expected to propel the motion sickness treatment market in Asia Pacific. The market in the region is likely to expand at a CAGR of 3.5% from 2018 to 2026. Availability of generics and fragmented market in the region are the major restraints of the motion sickness treatment market in Asia Pacific. The report also provides profiles of leading players operating in the global motion sickness treatment market. These include GlaxoSmithKline plc, Perrigo Company plc, Prestige Brands, Inc., WellSpring Pharmaceutical Corporation, Caleb Pharmaceuticals, Inc., Myungmoon Pharm Co., Ltd., Baxter International, Inc., and Reliefband Technologies LLC. Most of these key players emphasize on brand expansion through the introduction of new product or drug variants. GlaxoSmithKline plc and Perrigo Company plc are the only suppliers of prescription-only motion sickness treatment drugs, while Reliefband Technologies LLC is one of the pioneers in offering wearable device for motion sickness treatment based on Neurostimulation platform. However, there are numerous small and mid-sized OTC product suppliers operating in the international and regional markets. For instance, the first generic to transdermal scopolamine patch was introduced in the U.S. in 2017, while regional players have been offering their transdermal scopolamine systems in Asia Pacific since 2000. These factors have led to a fragmented motion sickness treatment market across the globe.